South Hedland was the first stop for Marnti warajanga’s tour of the Pilbara. 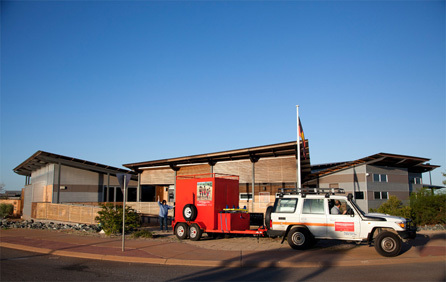 The exhibition was packed into a custom-made trailer in Canberra, and towed for eight days across the country, arriving in South Hedland on 1 May 2012. The team went straight to work, displaying the exhibition and running photography workshops at three venues: Hedland Senior High School, South Hedland Primary School and finally Wangka Maya Pilbara Aboriginal Language Centre. A community celebration was held at Wangka Maya to welcome the exhibition on the evening of 9 May. Leave a comment about your experience of the exhibition.